It wasn’t that long ago that most people just assumed that dentures were inevitable. They believed that eventually they’d have to replace their natural teeth with those old, loose-fitting dental appliances that could irritate the gums and make it hard to speak and eat normally. Times have changed, though, and modern dental technologies have created a lot of other options so many patients can avoid dentures. However, in some cases, dentures are still the best solution. That doesn’t mean you have to put up with those old, uncomfortable appliances, though. Today’s dentures look natural, and fit right in your mouth so no one ever has to know about your dental work. Modern dentures are nothing like those old appliances that slurred speech, made it difficult to enjoy certain kinds of food, and required special care to keep them clean. Now, you can replace multiple teeth with a strong, durable, and cosmetic solution that is far more comfortable and stable. While implants have been a great solution for patients who have lost one or two teeth, it’s not really practical when they’ve lost significantly more teeth than that. The solution to this problem is all-on-4 dentures. This way, we can use a fixed, full-arch prosthesis to replace your missing teeth while firmly affixing the denture in place. We still use titanium implants, but the solution only requires four of them to hold the device in place. This way we can restore the functionality and appearance of your mouth while minimizing the time required for the surgery and post-op healing. 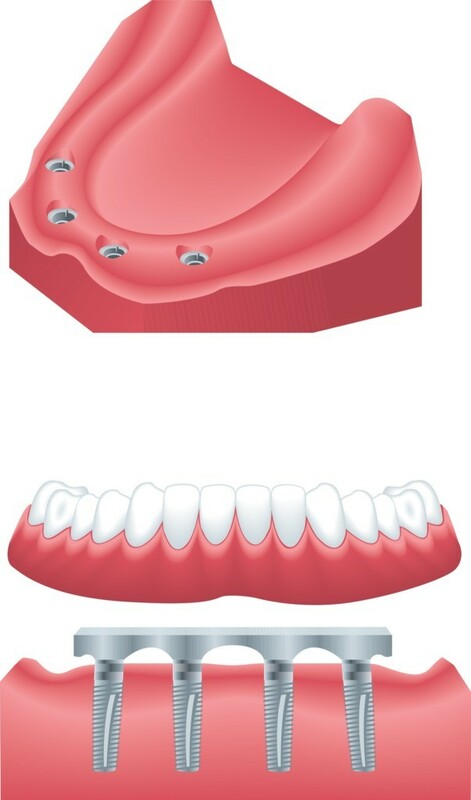 Implant-retained dentures can replace between 12 and 14 teeth, even though it only uses four implants. Your bone will actually fuse to the titanium implants, making this connection just as strong as natural roots. It will take some time for the bone to heal around the implants, and until they do you’ll be fitted with some temporary teeth until the healing process is complete and they will hold your new teeth. Since there are only four implants, the surgery and healing times can be significantly reduced. It may also reduce the need for bone grafts since these implants are usually longer than the standard models (to reach the anterior maxilla) and are tilted to improve stability. This is a permanent solution that you can treat just like your regular teeth. You don’t have to remove them when eating certain foods, and they can be brushed and cleaned just like your other teeth. Dentures are still a great solution for patients missing a number of teeth, and it’s important to replace them as soon as possible. Any gaps in your jaw where your teeth normally sit can lead to shifting, infections, and bone loss. Replacing them as soon as possible can restore your facial features and help prevent bone deterioration. Do You Have to Get Dentures? Despite the advances in dental technology, just mentioning the word “dentures” can really make some people anxious. The old image of those loose and uncomfortable appliances still permeates our culture. If you have a few teeth to trauma or decay, you may need to look into dentures as a possible solution. Just remember, though, a lot has changed, and modern dentures function and appear just like your normal teeth. We are always happy to discuss your concerns. We’ll take the time to describe your options in details so you can make the best choice for your dental health. Does The Color Of Your Teeth Define Their Health? Why Are My Teeth Sensitive, and What Can I do About It?